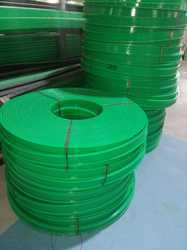 UHMWPE Wear Strips and Guides ensures low coefficient of friction, noiseless and smooth operation. Standard shapes are available at Ex-Stock and others are made against order. Wear plates and wear strips are used to reduce wear or erosion in mechanical systems. They are resistant to the abrasive effects of the bulk processing of grain, ore, salt, limestone, coal, glass and fly ash. Looking for UHMWPE Wear Strips ?